Global warming is a thing and how humanity survives it remains to be seen. 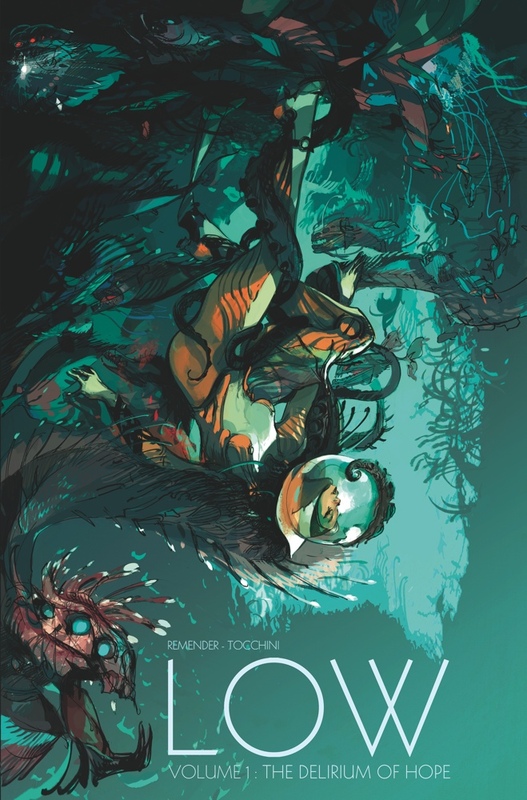 In Low: Volume 1: The Delirium of Hope from Image Comics, Rick Remender and Greg Tocchini has humankind retreating to the bottom of the ocean to escape the sun's scorching radiation. One woman believes she can save the human race, and she’s turned her gaze to the stars. But Stel Caine may be the only one with hope — civilization is deteriorating into hedonism and corruption around her, and she must do all she can to not only save humanity but also keep what’s left of her family from falling apart. A beautiful, fragile world; a society collapsing under its own decadence; a complex woman whose hope keeps her from despair — this is the science fiction world of Low: Volume 1: The Delirium of Hope, in comic book stores on March 25 (Diamond Comic order code DEC140670) and bookstores on April 7 (ISBN 978-1-63215-194-0). It is available for pre-order now. Full press release below.